I spent that nice day trying to save in urgency my numerous and heavy audio and video archives and transfering them to different external hard drives and DVDs hoping it will give more energy and oxygen to my computer which shows very worrying signs of weakness these last days and didn’t work correctly. So no time and no possibility for a very creative post to celebrate that 7th anniversary but with luck maybe my cleaning will help and I will be able to do something better in a not too distant future !! 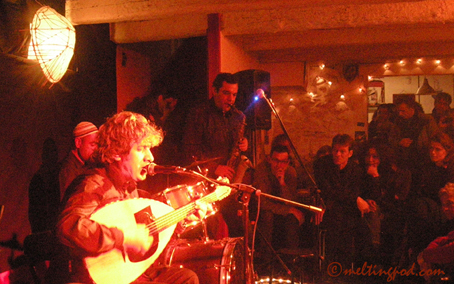 My good friends from Oriental Fusion (Hakim Hamadouche vocals and mandoluth, Ahmad Compaoré drums and Edmond Hosdikian sax) reforming the band after a 10 years break at La Meson in Marseille February 18th 2012 : a videoclip from that great night soon ! The International Women Day March 8th my podcast Meltingpod will be 7 years old, hoping I could publish some new songs you never heard before…:) and by a lucky coincidence Ed Kuepper chose also that day to release his new studio album “Second Winter”..so stay connected !!! This entry was posted on Jeudi, mars 1st, 2012 at 18:03:47	and is filed under music talk rock. You can follow any responses to this entry through the RSS 2.0 feed. You can leave a response, or trackback from your own site.